Close to 25 million people, are currently in forced labor worldwide. Among the most vulnerable in society, they often include children, people with little to no formal education, and migrants. Most migrant workers come from marginalized situations, setting out abroad with the hope of earning an income to feed themselves and their families. In a comprehensive study, ECCHR has examined whether European companies through their transnational operations cause or contribute to forced labor or other labor abuses along their supply chains and whether they can be held to account. The result of this work is reflected in the report Accountability for forced labor in a globalized economy. 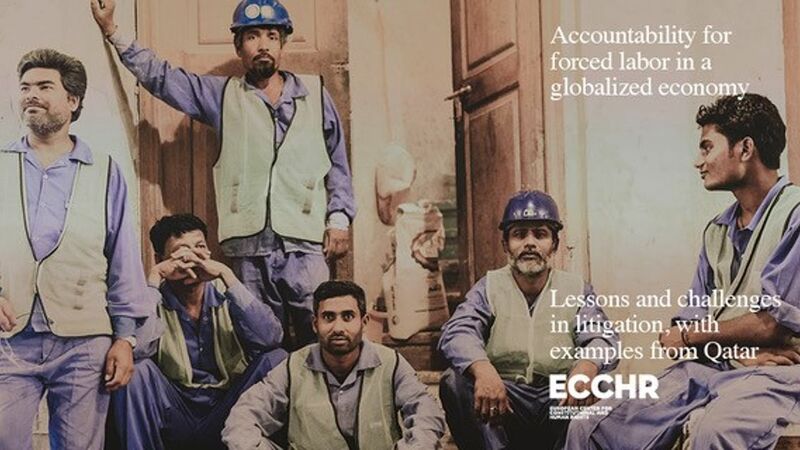 For its research into the topic of forced labor in transnational supply chains, ECCHR focussed on the construction sector in Qatar. This included cooperation with local partners in the home countries of migrant workers and research on the ground in Qatar. The problem of labor exploitation in the Qatari construction sector has received increased public attention through reporting on the massive expansion of construction projects ahead of the 2022 FIFA World Cup. However, the problem does not only persist in Qatar and other countries in the Gulf region. Forced labor is driven by the dynamics of a market-oriented global economy. In countries like Bangladesh, India or Kenya, there exists a growing number of "working poor." Both poverty and a global work force vulnerable to forced labor are socially constructed conditions that feed a demand for cheap labor that ensures profitability of labor-intensive sectors. Forced labor risks are particularly high in sectors that rely on outsourcing their operations, such as construction, hospitality, domestic or care work, all of which frequently rely on migrant workers. The companies that operate in these sectors can be often characterized by long (labor) supply chains. These supply chains dissociate transnational corporations from abuses on the ground. The process of exploitation often begins with malpractice in recruitment, which is widespread in global labor supply chains and, in its worst form, can amount to human trafficking. Companies need to take a proactive and preventative approach through human rights due diligence, by substantially addressing concrete risks of labor exploitation in their supply chains, taking into account realities on the ground. A company that does not verify and act upon bad recruitment practices in its supply chain not only sustains the conditions for forced labor, but also risks complicity. Migration offered an opportunity to change their lives. It was risky, uncertain and certainly hard, but it was a risk they were prepared to take. The absence of choice made the choice simple. States produce national action plans on business and human rights to implement the UN Guiding Principles on Business and Human Rights. The OECD Guidelines for Multinational Enterprises promote responsible and sustainable corporate conduct globally. The UN Guiding Principles on Business and Human Rights aim to promote corporate responsibility for human rights.